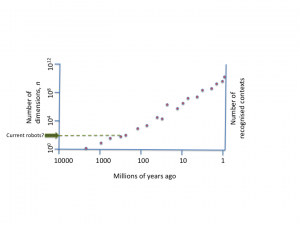 A hypothetical plot of the number of dimensions needed to describe the current sensory+motivational state in the most evolutionarily advanced organisms since the start of life (about 4 billion years ago) and now. If the current state-of-the-art robots are considered in the framework described here, e.g. the winners of the robot football world cup or the autonomous vehicle DARPA challenge, then what is [math]n[/math] for these robots, i.e. what is the dimensional space in which they are working (to the nearest order of magnitude) and how many sensory+motivational contexts are they able to recognise? How hard is it to translate the way a current state-of-the-art robot is programmed into the framework described here? If very different programming principles are used, why is this? Is there evidence that a strategy along the lines described here would inevitably fail when applied to a complex, unpredictable situation like playing football? If the strategies used by today’s robots can be related to the type of ‘multiple reflex’ approach advocated here, then it would be interesting to trace the rise of [math]n[/math] over time as more complex robots have been developed. Assuming the same thing could be done with animals (and plants), it would be interesting to compare the two plots. This page was last edited on 6 June 2018, at 15:07.